Cardiff has been voted the best place to live in the UK as well as the most sociable city, so come and socialise while learning a bit more about wine! Whether your wine tasting in Cardiff is to catch up or celebrate with friends or as corporate entertainment for clients or team building with colleagues, we'll have a wine tasting to suit you. We have a number of different wine tastings and formats from pure entertainment to educational, but the most important element is having fun. We also run regular wine tasting events in Cardiff including a fun evening wine tasting, as well as our one day and WSET courses which are more educational for those who want to learn more about wine in a fun environment. All from ThirtyFifty the award winning tasting company. 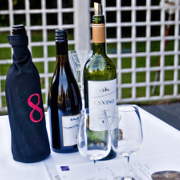 We run regular wine tastings in Cardiff from 2 hour evening sessions, one day wine courses and the more formal WSET courses that lead to nationally and international recognised quaifications. The tastings are educational and fun, ideal for anyone with an interest in wine. Below are forthcoming events in the area. To book select the date you'd like to attend below to add to your basket. We also offer open dated vouchers open dated vouchers perfect as a gift. If you are looking to go out for your wine tasting we have worked with a number of venues in Cardiff that we are happy to recommend. The list below highlights our most popular wine tasting venues in Cardiff, to see our full list of venues across the country please go to our venues page.